A young woman steers a boat through old ruins, young boy in tow. She pulls up to the remains of a watchtower, hoping to find refuge. She carries her brother inside, and lays him down. He has a gash on his stomach. He might not make it. See that wound? Yeah. You need to take care of that. And so you brave the waters of a mysterious flooded city, to find supplies and rations to keep your brother alive for one more day. I spent about an hour and a half playing the game on the PS4 last night. Right now, Submerged seems like what you would get if you crossed some ideas from Enslaved: Odyssey To The West and Ico. Submerged doesn’t always nail the execution, though. The most immediate thing you’ll notice is all the sailing. The world is, as the title suggests, submerged in water—so you need a boat to get from place to place. Thing is, you have no clue where anything is. Initially, this lends the game a sense of wonder. Where are you? What caused the world to look like this? How long has it been since society collapsed? The overgrowth on the ruins suggests it’s been a long while, but if that’s the case, where did you and your brother come from, exactly? Submerged is coy about those details. If you want, you can collect pieces of parchment that outline the ‘history’ of the world, but they’re all fairly abstract and resemble cave drawings. These collectibles are pretty much everywhere, a detail that made the game feel like it didn’t know when to show restraint. The cool thing about subtle games like Shadow of the Colossus or Bloodborne how they manage to withhold information from you while also baking a tangible sense of history into the environment. This, in turn, makes the games feel confident. Submerged feels like it wants to follow suit, but it can’t quite help itself from showing you too much. Regardless, it is still a joy to cruise through the post-apocalypse and take in the view. Occasionally, you’ll even find useful parts floating out in the water. I particularly loved when I spotted sea creatures, like dolphins or whales, swimming around me. Curiously, many of these creatures looked mutated. I’m sure that you can find out why, provided you collect the right pieces of paper. Once you spot a lootable building, you can disembark and explore it. This is where the bulk of the game lies, in exploring abandoned buildings. Specifically, in using ledges and pipes to climb buildings. This is controlled entirely through the left thumb stick; you don’t even have to press a button to jump. You can simply press up on the stick, and your character will jump. The buildings you scale have all sorts of pathways leading to different areas. The most obvious ones lead to the supplies you need to bring back to your brother, but you can also spend some time satiating your curiosity about what else lies hidden in these buildings. Unfortunately, I found the climbing mechanic pretty dull; nothing more than a chore necessary to get where I was going. More importantly, though, the climbing took me away from the water—the game’s biggest strength. 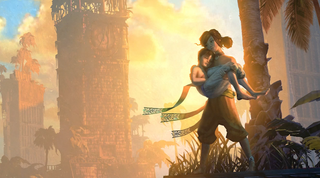 Submerged asks you to collect 10 items for your brother, which will end up requiring a hell of a lot of climbing. I will give props, though: Submerged doesn’t seem to care where you go to collect these items, or in what order you tackle the buildings. You’ll find what you need all the same, a feature that lets you roam and explore as you see fit. I managed to get about halfway through the game in an hour and a half last night, and while I wasn’t wildly impressed with the actual gameplay of Submerged, I did find myself becoming curious about the story and its world. While you never see other humans, you do sometimes come across other mutated humanoids. What is their deal, exactly? Am I destined to become like them? Will my brother turn into them if I don’t save him? Questions!